Who 'Wins' Under Our Bizarre and Complicated Corporate Tax System? "More holes than cheese" is how some experts describe corporate taxes, which the White House wants to overhaul as part of its new competitiveness campaign. The United States has the highest corporate tax rate in the world (besides Japan) at 35%. But many companies pay an "effective rate" considerably lower, in the teens in even the single digits, because they take advantage of loopholes or move their business overseas where earnings are taxed at a lower rate. The president wants to fix this. A lower corporate ax would mean more business in the U.S., more jobs in the U.S., and maybe even more revenue from domestic business going to the government. "Get rid of the loopholes," he said in his State of the Union. "Level the playing field. And use the savings to lower the corporate tax rate for the first time in 25 years -- without adding to our deficit. It can be done." Good luck. The problem with "leveling" the playing field is "filling" the holes is that you might raise taxes on companies who benefit from the holes in the first place. 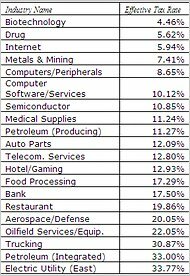 Via Economix, here's a short list of average effective tax rates by industry. In a nut shell: Companies with high R&D spending or a large overseas presence pay very little, and companies that do business mostly inside the U.S. pay very high. A simpler tax code with fewer holes would mean less variation in ETR. Electric utilities and biotech companies would pay a similar rate. But do we really want to raise taxes on biotech and drug companies, which are arguably our greatest competitive advantage? Do we really want to strip out loopholes that benefit domestic manufacturers at the same time that we call for higher exports? The loopholes in the corporate tax code has created a system of winners and losers that reform would could overturn. That's just one reason why the debate about corporate taxes is much more complicated than the budget or deficit-neutrality.